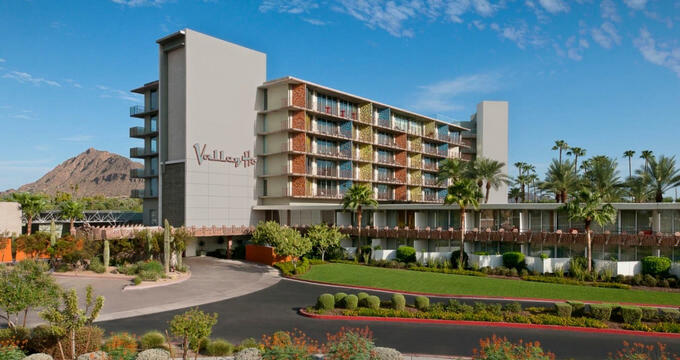 Located in Scottsdale, Arizona, Hotel Valley Ho has the classic mid-century design with all the modern amenities. With colorful Southwestern décor and architecture, Hotel Valley Ho is sure to impress. 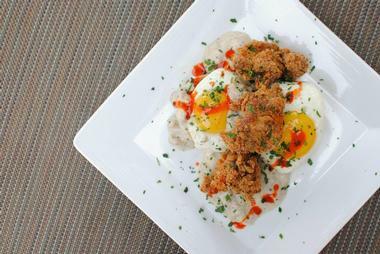 Hotel Valley Ho offers two types of lodging experiences for its guests. For a more modern feel, guests can choose to stay at the Tower. For a more historic design, guests can stay at the Hotel. The Tower has been called the hotel within the hotel. It gives a bird’s eye view of the desert landscape below. 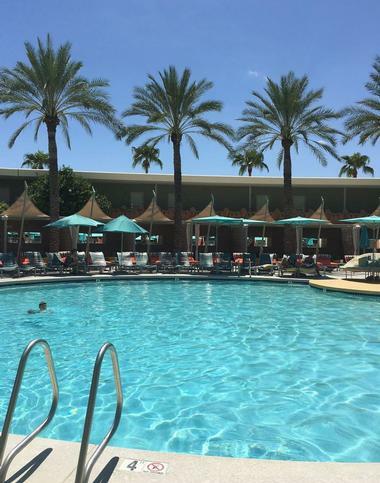 The Tower offers bright rooms and suites that provide guests with a view of the Camelback Mountain or the OH Pool and Downtown Scottsdale. The Tower design emphasizes luxury. There are a variety of rooms and suites available in the Tower. The Tower Signature Guest Rooms – These rooms are 450sf plus a private 75sf balcony. Guests can choose a room with one king-size bed or two double-size beds. There are glass doors that open to the private balcony. The Tower Suite – This suite is about 900sf plus a 150sf balcony. The Suite also includes a full kitchen, walk-in closet, washer, and dryer. The large bay windows provide views of Downtown Scottsdale and Camelback Mountain. The Tower Two Bedroom Suite - This style of suite is approximately 1,350sf and is perfect for guests traveling with friends or children. The master bedroom has a king-size bed and the adjoining bedroom is available with a king-size or two double-size beds. Additional amenities include a kitchen, walk-in closet, and washer and dryer. The Tower Loft Suite and the Presidential Loft Suite – Both types of suites offer similar room and amenities. They are approximately 1,335sf plus a 215sf balcony. These two-story lofts include a master bedroom with a king-size bed, all-inclusive kitchen, ample seating area in the living room and two private patios. There are also two full bathrooms. The Signature Guest Room – This style includes one king-size bed or two double-size beds. It is approximately 420sf and includes a 120sf patio or balcony. The Accessible Guest Room – These rooms accommodate anyone with any type of disability and meet ADA (Americans with Disabilities Act) guidelines and standards. It is approximately 420sf plus a 120sf private patio or balcony. Some of the unique accommodations offered in this room are lowered light switches and peephole, lowered closet shelves, ADA standard shower, and safety bars in the bathroom. The hotel also offers extra accommodations per request for any guest. The Pool View Guest Room – This style overlooks the OH Pool and OHasis Pool. 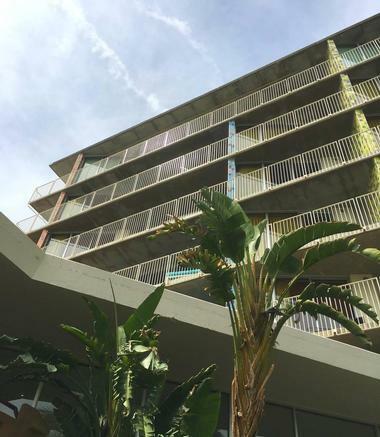 It is approximately 420sf with a private balcony or patio. Guests may elect for a room with one king-size bed, others may choose the rooms with two twin-size beds. The Studio Guest Room – This style is unique for its large tub the room is built around. It provides a lounging area outside on the private balcony or patio. This room is approximately 500sf with a balcony or patio. Visitors will sleep on a comfortable bed: King-size. The Cabana Guest Room – These rooms have an extra-large lounging area on the private deck or patio. This room is approximately 420sf with a 240sf patio with views of the OH Pool. There is one king-size, pillow-top bed. The Terrace Suite – This style of suite includes a spacious living area with lots of natural light. Guests can also enjoy the wrap-around patio. The Terrace Suite is approximately 850sf plus a 900sf terrace. This Suite includes one king-size, pillow-top bed. The Executive Suite – This luxurious suite was designed for entertaining. It is approximately 1,100sf with a 1,200sf terrace. The Executive Suite also includes a huge soaking tub for relaxation. The walls are painted in bright, vibrant colors and adds to the allure of the suite. The terrace wraps around three sides of the Suite. There is one king-size bed. The hotel offers many special amenities along with a guest’s stay in The Executive Suite. The OH Pool – This pool is more for kids, families, and other guests who wish to splash, have fun, and use the pools many fun activities. But, it also provides private, shaded cabanas for guests to take a break from the pool if they so choose. On summer weekends, there is live music playing poolside. There is also a bar with a table seating. Special cocktails are available daily along with sandwiches, paninis, and salads. The OH Pool also includes two hot tubs that are large enough to comfortably accommodate several people at once. The OHasis Pool – This pool is a more tranquil environment. It is ideal for guests looking to swim some laps or take a nap pool side. There are hovering palm trees and desert landscaping all around. Guests can order cocktails and drinks at their leisure. There are also more calming water features and modern lounge chairs that add to the relaxing atmosphere. The Hotel Valley Ho Spa – This luxurious spa is open daily to guests of the hotel. There are eight different treatment rooms, including lounges for men, women, and couples. There are also saunas with chromotherapy. Food and drinks are available for spa guests and can be enjoyed out on the spa deck or in the spa lounge. Spa treatments include massages, spa packages, beauty, skincare, and more. Guests wanting a spa treatment must call ahead of time to make a reservation. The Fitness Center - It is open 24 hours and includes free weights, cardio machines, and private television. The programs at the fitness center promote health and maintaining a healthy lifestyle for all its guests. Patrons of the hotel can enjoy a daily workout outside each morning, overlooking the pool or practice yoga inside the movement studio. There are also professional, skilled trainers available to guests. For locals, daily, monthly, retro fit and fit+ membership access is also available. Membership includes access to the fitness center, lounges, saunas, OH Pool and OHasis Pool. Personal training is also offered. For guests who enjoy nature, there is a guided 120 min. hike of the iconic Camelback Mountain. Trained guides lead the way to the best views of the Valley. Water is provided to all hikers and transportation is not included to Paradise Valley.